Multi-vitamin and mineral formula for active people! A get up and go formula of 11 vitamins and 9 minerals. 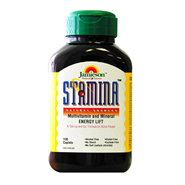 The Nutritional Sports Research Laboratories of Jamieson, Canada's foremost producer of specialized natural source vitamins, minerals and nutritional food supplements developed Stamina for active individuals. Prepared in a natural source of herbal and food nutrient base of Korean Red Ginseng, garlic and bee pollen. Stamina multi-vitamin and mineral formula is free from artificial colors and flavors, and has never been tested on animals.